I have a complicated relationship with boats – which I include ferries, canoes and general waterway transport under that general term. As a child, I spent many hours on ferries to Ireland and France for holidays with my family and used to enjoy the trips. Then one day as a teenager, I suddenly developed seasickness, which still plagues me now if I don’t take precautions. Despite my body’s physical reaction to boat trips, in my mind I still love to be at sea or on the river. I love the views and different perspective you can get of a place you know so well from a boat and the general romanticism of travelling on one. I love canoeing, the few cruises I have done I have enjoyed and I’m a qualified scuba-diver, which obviously means going on a boat. Generally, those who suffer from seasickness will attest it’s usually worse on the open sea than on a river. I have a close relative who actually lives on a house boat on the River Thames and I admit to feeling slightly queasy when the tide moves in or out making the boat shift with it. However, despite my ups and downs with sea travel, whenever the temperatures soar in London during our heatwaves, I always recommend the River Thames as the best place to be. The river is generally always the coolest place in the capital all year around – in the winter there’s a blistering cold wind, while in the summer it is transformed into a ‘cooling breeze’ while the rest of the capital sweats it out. So when we had our mini heatwave in late May, which happened to fall on my lieu day off work, I suggested a river cruise with my friend @missgeorgieanne. I had previously been down the river about six or seven years ago (during another heatwave when it was around 33C I seem to recall) and have fond memories of it. This time round, it was supposed to be about 29C, but it was very humid and felt even hotter. Before hitting Westminster Pier – where most of river cruising companies have ticket booths and start from, I did some research on the internet. National Rail (overland trains) have teamed up with a majority of London tourist attractions (and some shops, theatre productions and restaurants) to offer discounts – some as much as half-price. So if you’re starting a journey from an overland train station either in or out of London, keep hold of your ticket, visit the Days Out Guide website and sign up for the appropriate voucher. So armed with my voucher and my paper travelcard, I was able to buy a reduced ‘Rover’ ticket (unlimited hop on, hop off) for City Cruises for my friend and I (Top tip: Buy the ticket online from City Cruises website and it’s even cheaper). With it being glorious sunshine, we headed for the open deck and landed a plum seat in the front row with an uninterrupted view of the shimmering waters (yes, I know the Thames looks a bit murky, but when the sun shines it really does glimmer!). One thing that appealed to me about City Cruises is that is has a licensed bar so it was cider on ice all round – we even inspired some American tourists seated behind us to order the same. Setting off down river on the trip to Greenwich Pier – stopping at Tower Hill on the way – we were given a commentary by one of the crew. Although they say it isn’t an official guided tour – there aren’t any multi-lingual options unfortunately – the crewmember was very informative and funny. Having grown up in the city, my friend and I are bona-fide Londoners and assumed we would know much of the information provided, but were pleasantly surprised with our new discoveries. For example, the London Eye has 32 pods – one for each of the London boroughs. I’ve been on the London Eye about seven to nine times (with friends and relatives from abroad) and I had never heard that fact. While I’m mentioning the London Eye, I must recommend it as one of my top 5 tourist attractions in London. It moves nice and slowly for those worried about feeling sick (despite my seasickness – I actually love heights) and the 360 degree views around London are stunning. We cruised on past the Savoy Hotel, Cleopatra’s Needle (Click here for Metro Girl’s blog on the history of Cleopatra’s Needle), the Royal Festival Hall, the Tate Modern, Shakespeare’s Globe, St Paul’s Cathedral and under the ‘wibbly wobbly bridge, aka the Millennium Bridge, which links St Paul’s with the Tate Modern and gives a great view of the river and Tower Bridge. Although not one of our most decorated or admired, Waterloo Bridge is known for having one of the best views of the river out of all the bridges. However, cruising underneath it, my memory was jolted with a fact I had long forgotten that it was actually built by women during World War II, so is often referred to as the ‘ladies bridge’. I have a special fondness for Waterloo Bridge personally as I used to spend my half-term and summer holidays as a child playing on the South Bank nearby. 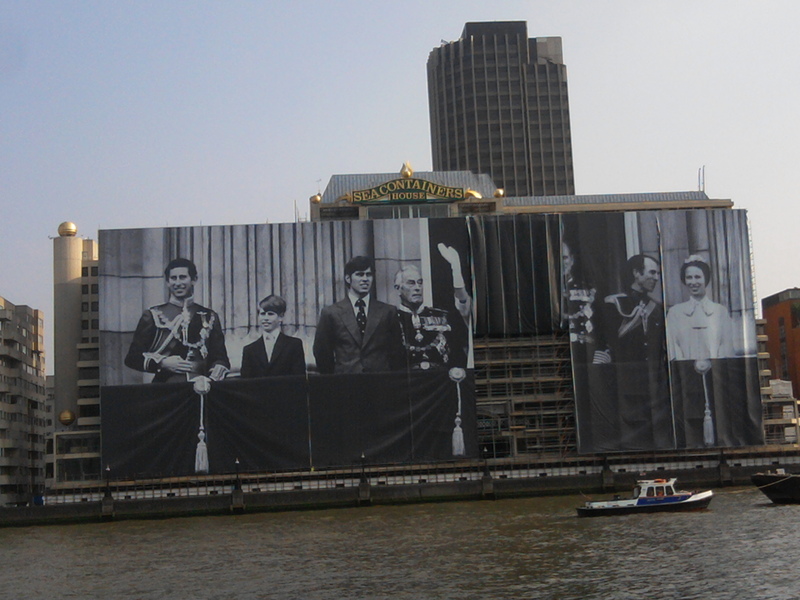 was in the process of being draped with a giant Jubilee wrap featuring the Queen and her family on the balcony of Buckingham Palace during her 1977 Silver Jubilee. When we passed it on the way back to Westminster Pier, everyone had been unfurled except the Queen herself (although I, and the Royal Family of course got to see it on the rainy Jubilee Sunday during the flotilla a week later when I ended up finding a spot on the north bank of Blackfriars Bridge so right opposite the wrap). Ninety minutes later after setting off from Westminster, we arrived at Greenwich Pier. We were pleased to be greeted with the newly restored Cutty Sark. Londoners were saddened when the world’s last remaining tea clipper was badly damaged during a fire in 2007 – a few days after I had last visited it actually. However, the phoenix has well and truly risen from the ashes and is back in action for visitors and Londoners to admire. Although its situated slightly differently from the last time I saw it – it has now been lifted 11ft off its dry berth and is surrounded by a glass structure containing an interactive museum. (For Metro Girl’s blog post on the sunset from Greenwich, click here). 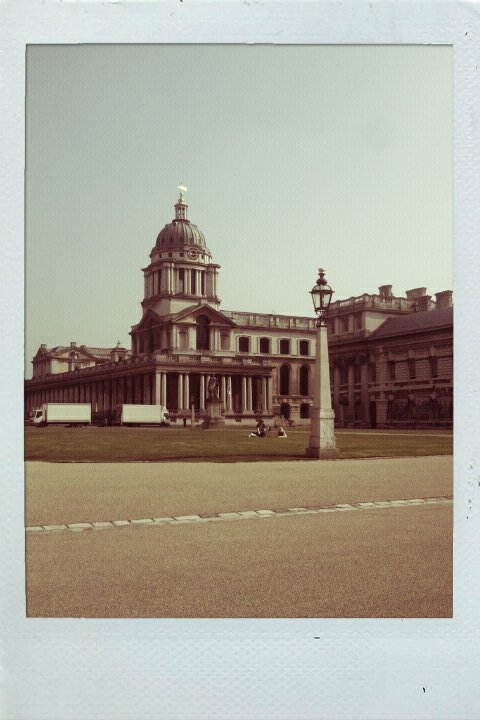 To first-timers visiting Greenwich, the Royal Borough (its new title after being bestowed with it by the Queen earlier this year), there is a lot to keep you occupied for the day. As well as the bustling market, there’s the park, Observatory, the National Maritime Museum and various riverside pubs… the list goes on. As we only had limited time, after stopping for a refreshing 99 ice cream, we headed up into Greenwich Park for one of the best views in London – fact. However, due to the imminent London 2012 Olympics, the northern section of the park was partially closed off as it is currently being transformed into an Equestrian centre for the games. After climbing the hill, we arrived outside the Royal Observatory – the centre of the world in terms of time. Greenwich Mean Time (GMT) of course originate here and in places both inside and outside the gates of the Observatory you can stand with one foot in each Hemisphere (East and West of course… we’re nowhere near the Equator!). As well as the Observatory, there’s also a great view of London’s new ‘City’ – the financial district of Canary Wharf. After all the walking and sun-worshipping, we decided to seek shade with some afternoon drinking – yes, more cider on ice – at the historic Trafalgar Tavern – just on the opposite side of the Old Royal Naval Gardens and buildings from the pier, on Park Row. The Regency pub was built in 1837 and features bay windows overlooking the river and Isle Of Dogs opposite and plenty of outdoor seating for those warm summer days and nights. Sipping cider, resting our legs and gazing out over the river was a perfect chilled ending to the day before embarking on our ride home. Oh yeah… one more thing, I didn’t feel seasick – not a bit! On the cruise, we passed many popular London tourist attractions – vote for your favourite. Although we went on City Cruises, there’s also a host of other companies that do river cruises (both daytime tourist ones and night-time dinner ones), including Crown River, London Eye River Cruise and Thames River Services. To read about Cardinal’s Wharf, an 18th century house located in between the Tate Modern and Globe, click here Cardinal’s Wharf: A survivor of 18th century Bankside amidst two London landmarks. Posted on 10 Jun 2012, in History, London, Tourist Attractions and tagged Greenwich, London Eye, River Thames, Tower Bridge, Waterloo. Bookmark the permalink. 8 Comments.